Teofimo Lopez: "I'm not waiting for Lomachenko"
By Aragon Garcia: Teofimo Lopez says he won’t be waiting for Vasyl Lomachenko to fight him beyond 2019, because he plans moving up to light welterweight [140 lbs] in 2020 to go after the world champions in that weight class. Lopez says he’s not an “opponent” type of fighter for guys like Lomachenko. Lopez (12-0, 10 KOs) says his goal isn’t to fight Lomachenko. It’s to win world titles, and Lomachenko happens to be the WBA/WBO 135 lb champion at the moment, which is why Lopez wants to fight him, but he’s not going to wait indefinitely. Lopez’s not going to wait on a fight against WBA/WBO 135 lb champion Lomahcneko (12-1, 9 KO). If he doesn’t make the fight with him, Lopez says he’s going up to 140 to challenge the champions for all their titles. Lopez, 21, only wants the world champions. Lopez continued with his “takeover” project last Saturday night in stealing the show from the main event fight between light heavyweights Eleider Alvarez and Sergey Kovalev by knocking out Diego Magdaleno (31-3, 13 KOs) in the seventh round on ESPN+ at The Ford Center at The Star, in Frisco, Texas. Lopez knocked the 31-year-old Magdaleno out with consecutive left hooks to the head in the 7th. 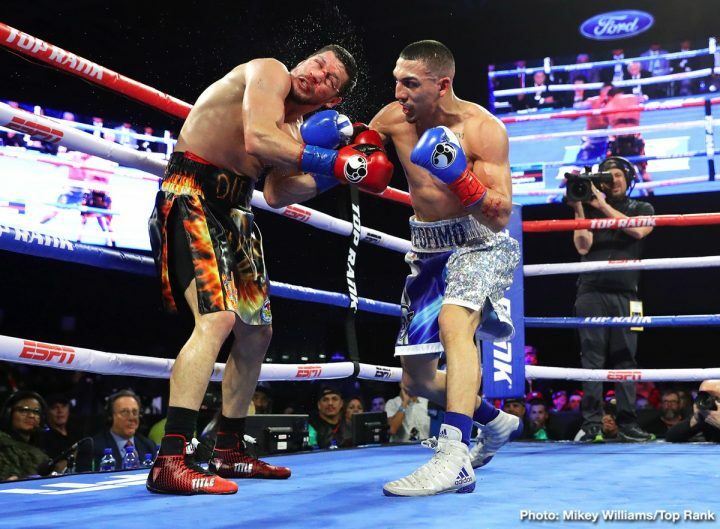 “I already believe I’m world champion,” Teofimo Lopez said to Fighthype and the other media following his knockout win of Diego Magdaleno last Saturday night. “With time, they have to put the label on. It could be the middle of this year or at the end of the year. I know in 2019, they have it in their minds that Teofimo Lopez deserves a world title shot. You fight the best to beat the best, and to be the best. So to everybody, they’re [Mikey Garcia and Vasyl Lomachenko] the best, but to me, they’re not. But in order to shut up the critics, is by putting us in line with them,” Lopez said. Lopez is probably not going to get a chance to fight for a world title in 2019 unless he moves up to 140. Lomachenko has his eyes set on winning the International Boxing Federation 135 lb title that was won by Richard Commey last Saturday. Lomachenko and Commey will be fighting in April. When/if Lomachenko beats Commey, Top Rank will try and setup a unification match between Loma and WBC lightweight champion Mikey Garcia for later this year. Mikey is fighting on March 16 against IBF welterweight champion Errol Spence Jr. It’ll be up to Mikey if he wants to come back down to 135 to fight Lomachenko for his IBF, WBA and WBO belts at that time. “April 20th at Madison Square Garden on the Crawford-Khan pay-per-view undercard,” said Lopez when asked when he plans on fighting next. “I’m happy about it. By this week coming up or early next week, I should find out [next opponent for April 20]. Yes, first pay-per-view appearance, but it won’t be the last. I’m glad that you guys liked it, but I wasn’t happy,” Lopez said. Having Teofimo on the Crawford-Khan card will at least give the card potentially one good fight. The main event is a horrible one. Khan doesn’t belong inside the ring with Crawford fighting for a world title after his two wins over fringe contender Samuel Vargas and Phil Lo Greco. Before those two wins for Khan, he was knocked out by former WBC middleweight champion Saul Canelo Alvarez two years before that in 2016. Khan was out of the ring for two years before beating Lo Greco and Vargas, and now he’s being given a world title shot. Top Rank needs to find someone good to match-up against Lopez. It can’t be another Magdaleno level fighter Lopez should be fighting talented guys that will get him ready for the Lomachenko fight. “I know they’ve been talking that they want to us with him this year. That’s official, but when?” Lopez said about a fight between him and Lomachenko. “We don’t know yet. Absolutely [Teofimo wants to fight Lomachenko], but this years is my last year at 135. Lomachenko is going down to 130 and doing all this stuff. I’m not going to wait for him. I’m not going to wait for no man. I’m not an opponent. I am a champion, me. Don’t treat me like an opponent, like I’m his lunch food,” Lopez said. Lopez is going to likely fight another contender level guy in his next fight on the undercard of Terence Crawford vs. Amir Khan on April 20 on ESPN PPV. There’s no way that Lomachenko will fight Lopez on two month’s notice. When or if the Lomachenko vs. Lopez fight does take place in the future, it’s going to be in the main event and likely on pay-per-view. What could potentially complicate things in a dramatic fashion is if Lopez moves up to light welterweight in 2020 without getting a fight against Lomachenko in 2019. There are rumors that Lomachenko is going to move back down to 130 lbs [super featherweight], being that he’s taking too much punishment at lightweight, and he’s no longer dominating guys like he was doing at featherweight and super featherweight. If Lomachenko does move back down to 130, and Lopez moves up to 140 in 2020, then the only way the two of them could fight each other would be at a catch-weight. That’s not likely to happen. Lomachenko wanted no part of fighting at catch-weight against Rigondeaux in 2017. So the only way the Lomachenko-Lopez fight would happen is if Teofimo moves all the way down from 140 to 130 to fight Lomachenko at super featherweight in order to give him the advantage, like he had against Rigondeaux. Lopez is a proud fighter, and he’s probably not going to even consider that idea for even a second. “I’ve been at this weight for six years,” Lopez said about him fighting at lightweight [135 lbs]. “It’s not tough. It’s that I just have to be very, very disciplined. I only go up 10 or 12 pounds after camp, because if I go up too much, I know I’m not going to make 135 no more. 140? Everybody,” Lopez said when asked who he wants to fight at light welterweight when he eventually moves up in weight. “Put them in front of me, and I’ll beat them; world champions though. We are going to fight for world titles. That’s what our goal is. It doesn’t matter who it is. My goal isn’t to fight Lomachenko. My goal is fighting for the titles. So whoever has the world titles, that’s who I’m going for. I don’t have nothing against the man [Lomachenko]. Since he has the title, that’s who I have to fight,” Lopez said about Lomachenko. Top Rank promotes the 30-year-old Lomachenko, but they can’t force him to take fights against certain guys if he and manager don’t want the match. At this stage, Lopez might be more trouble than he’s worth for Lomachenko. The Ukrainian fighter is starting to show his age in his last two fights against Jose Pedraza and Jorge Linares. Those were not easy fights for Lomachenko, and some believe that he’s starting to get old. It could be that or Lomachenko isn’t cut out to be a lightweight. If he moves back down to super featherweight, he could avoid guys like Teofimo Lopez and Mikey Garcia. But if Lomachenko does that, Gervonta ‘Tank’ Davis (20-0, 19 KOs) will be waiting for him, and that’s not going to be an easy fight for him. Lomachenko has been busy fighting small guys like Guillermo Rigondeaux, a fighter that had to move up two weight classes to fight Lomachenko in December 2017. Since moving up to lightweight in 2018, Lomachenko hasn’t looked nearly as good in fighting guys his own size against Linares and Jose Pedraza. Those guys had the size to hit Lomachenko back, and he had a hard time against both of them.